I love how sometimes the loss of color elevates a picture to a new level. Kristen and Danny. 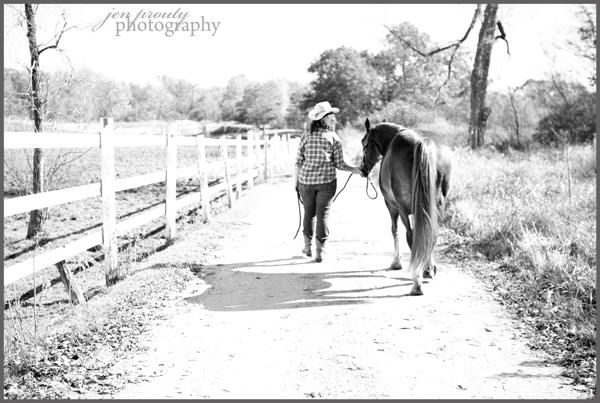 Just a girl and her horse walking down a country lane. The black and white conversion adds to the feel of this scene..........B&W paints a new level of contrast, grit, detail. It focuses your eye to the subject while highlighting the rustic fence. road. trees. It keeps the color from distracting your eye and allows you to focus on what is important. Kristen and Danny. Just a girl and her horse enjoying the day with no other distractions. Beautiful photo. I love the way the shadows fall.